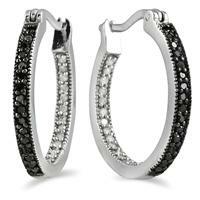 A special Thanksgiving Day Deal on a sparkling pair of black and white diamond hoop earrings. A stunning pair of top of the line graded, genuine black and white diamond hoop earrings. 16 perfectly cut round black diamonds lace the front of the earrings while 16 sparkling white diamonds line the inside. 32 diamonds total. A fantastic pair of hoop earrings perfect for any occasion!